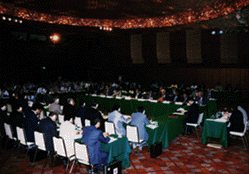 On August 26 and 27, 1988, the Pacific Island Nations Conference was held in Tokyo under the auspices of the Sasakawa Peace Foundation. The Conference unanimously elected Tadashi Kuranari as its chairman. The Conference was opened by Ryoichi Sasakawa, Honorary Chairman of the Sasakawa Peace Foundation. A message by the Prime Minister of Japan, Noboru Takeshita, who is on an official visit to China, was read on his behalf by Keizou Obuchi, Minister of State, Chief Cabinet Secretary. The participants from the Pacific island countries noted that this was the first time for so many leaders of the Pacific island countries to gather and exchange opinions and ideas concerning problems and prospects facing their countries and cooperation with Japan. They also expressed their appreciation to the Sasakawa Peace Foundation for organizing the Conference and for the contributions and personal commitment which Ryoichi Sasakawa has made to the Pacific island countries. The Conference participants agreed that, because of the rapid advances in science and technology over recent years and the socio-economic changes surrounding the Pacific island countries, this region could no longer be considered an isolated part of the Pacific. They also agreed that the unfolding of the so-called "Era of the Pacific," which has received increasing attention amongst Pacific Rim countries in recent years, should be equally meaningful to the Pacific island countries as well. In reference to development problems experienced by the Pacific island countries, it was pointed out that rapid modernization and Westernization gave rise to many distortions in their societies, and that contradictions emerged, shaking their traditional social and cultural values which were based on social harmony and consensus. The participants from the Pacific island countries agreed that it was necessary to bring about economic development in harmony with their traditions, and to maintain the "Pacific Way." On this point, it was suggested that the Japanese experience could serve as useful reference. Concerning the present state of social and economic development in the Pacific island countries, it was noted that their economic stability was a prerequisite for peace, security and political independence, but that they presently faced various difficult socio-economic problems. In reference to the political situation, it was pointed out that certain progress has been obtained, as in the case of the South Pacific Nuclear Free Zone Treaty. Domestically, many Pacific island countries, it was stated, have a dual economic structure consisting of a subsistence agriculture and fisheries sector which is not yet adequately integrated into the monetized economy, and a weak modern sector. They have to cope with complex development problems in both of these sectors. Reference was made to concrete problems such as inadequacies in the food supply system; under-development of infrastructure facilities like transport and communication and of social services like education and public health; extensive unemployment, and excessive concentration of population in urban centers (particularly in the Melanesian region, as brought about by rapid population growth); lack of natural resource endowment in most of the countries; the weak structure of their economies because of dependence on monoculture exports, inadequate remittances from abroad, and inadequate foreign assistance; and natural disasters such as cyclones. The possible impact of the global Greenhouse Effect on the Pacific island countries was also discussed as a long-term concern requiring investigation. It was emphasized that, in order to solve these socio-economic problems and secure greater self-reliance in their economies, these countries needed to step up their efforts in education, training, and human resources development. Building up an infrastructure geared to the development of fishery and tourist industries and strengthening the productive capacity of small-holder farms were also considered essential. The conference participants agreed that in order to bring about these developments, the Pacific island countries require aid that is suited to their true socio-economic development needs. The importance of private sector investment in the development of these countries and the need to prepare an appropriate investment environment to this end were emphasized. It was pointed out that regional cooperation could be an effective instrument in tackling some of above-mentioned problems if pursued in a manner complementary to bilateral relations. The conference participants agreed that for the future development of the Pacific island countries not only Official Development Assistance, but cooperation by Non-Governmental Organizations must be mobilized. In this connection, the participants from the Pacific island countries pointed out that information on the activities of Japanese NGOs was quite limited. The Conference chairman promised to provide data on 270 development-related NGOs in Japan to them as soon as possible. The participants from the Pacific island countries requested that Japanese private organizations further enhance their cooperation with the Pacific Island region. There were high expectations for the proposal to establish a Pacific Island Nations Foundation as such an initiative. The conference participants agreed that Japan, along with other countries which have made important contributions to the region, has become one of the important partners of the Pacific island countries and that its role should expand in the decades to come. It was confirmed that in order for the relationship between Japan and the Pacific island countries to grow, it would be necessary to expand exchanges of people - especially those between members of the younger generation - as well as the exchange of information. The participants from the Pacific island countries expressed their appreciation for Japan's cooperation and for the increased attention which it is paying to their region. 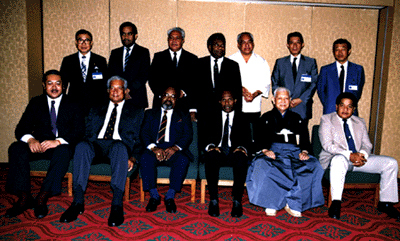 Above all, the visit by former Foreign Minister Tadashi Kuranari to the region in January 1987 and his announcement of the so-called "Five Kuranari Principles" were highly appreciated as they touched off an increased concern in Japan for the Pacific island countries. The Pacific island country participants expressed their hope that the friendly and cooperative relationship between Japan and the Pacific island countries will be further strengthened, accompanied in particular by increased Official Development Assistance, expanded cooperation from Non-Governmental Organizations, and increased investment by the private sector. In this connection, certain measures to be taken to strengthen the cooperative relationship, for example, the establishment of a wise men's committee, were proposed. It is a great honor for me to inform you that the Pacific Island Nations Conference sponsored by the Sasakawa Peace Foundation has ended with great success, thanks to the contributions which you, the representatives of ten countries, eight associates and others concerned about the future of the Pacific Island Nations, have made. I would like to express my heartfelt gratitude to you all. The preceding chairman's summary has covered all the topics discussed at this conference, as well as the various aspirations confirmed here. However, I would be pleased if you would permit me to add a few remarks here about what I sensed through my ears, which heard silent voices, and through my eyes, which saw invisible sights. During this conference I saw the vast, deep blue waters of the Pacific Ocean. I saw the sun setting on the horizon over the waves, and the Southern Cross. I heard the rustling of coconut palm leaves in the breeze and the sounds of festival drums. All these sights and sounds spoke resoundingly of the cultures, the pride, and the beliefs held by the peoples of this region, and cogently proclaimed the unceasing endeavors being made for the progress and stable development of the region. Being neither a president nor a prime minister, I gave thought to what I would be able to do as one private citizen, as well as to how I could contribute to the needs expressed by these voices. The idea occurred to me of establishing a "Sasakawa Island Nations Foundation" with, let's say, an endowment of three billion Japanese yen. Through the activities of this new foundation, I believe without a doubt that these island nations and Japan will be joined together in tighter bonds, while at the same time the socio-economic development of these countries will be enhanced and the hopes and aspirations of their peoples will be realized. During this conference, I also heard voices praying for world peace and the abolition of nuclear weapons. It is my wish that truth may always be expressed strongly in commonplace words. "The world is one family, and all mankind are brothers and sisters" is my creed, and, for me, it holds a message of world peace and the emancipation of humanity from all forms of distress. Although I personally have always appealed for the abolition of arms and the eradication of nuclear weapons, this is a fervent prayer held by all mankind. It will be my greatest pleasure if this conference and the establishment of the new foundation can, even to a small extent, contribute to realizing this, mankind's most praiseworthy plea. On behalf of the Sasakawa Peace Foundation, I would like to express my sincere gratitude to all of you.